There are a small set of regular questions that tend to come up regarding character behavior. For example, which character is in the front of the party? Which is carrying a light source? The particular questions may vary depending on the particular style of game, but most games probably have some such common character jobs. Rather than regularly determining such details explicitly every time, common jobs could be defined beforehand and marked on character sheets. For purposes of discussion here, call these common jobs roles. Players may always override a role specification situationally, but otherwise the role specified beforehand would function as a set of default actions and dispositions. Such predetermination supports the attribution of player decisions to planning rather than expedient choices of the moment. For example, if a player gives their character the Scout role, they will never find themselves telling the referee that their character would have been scouting after the referee declares an ambush is underway. Roles as described here have some similarities to Burning Wheel instincts mechanically, though they are less open-ended. Roles function as tags with interpretation specific to the current level of gameplay abstraction. 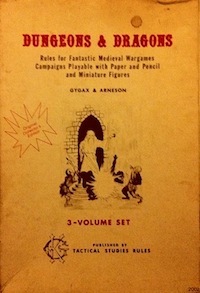 The games I run generally operate at one of four different scales, as modeled by the Hazard System, from most abstract to least abstract: Haven, Wilderness, Dungeon, and Combat. Each role may have consequences at multiple scales. For example, the Vanguard role means, unless the player declares otherwise, that a character is near the front of the marching order when exploring dungeons, will be part of the front rank if combat begins, and will guard allies when searching a room for hidden features. Multiple characters may take the same role, though high role redundancy decreases the utility of using roles at all. For example, if everyone is a Scout then, functionally speaking, nobody is. If after consulting role specifications and the current fictional situation it is still not clear, for example, which vanguard character would have been the one to open some box, the players could always decide or the referee could determine the result randomly. However, I suspect role + situation is enough to eliminate ambiguity most of the time. When exploring, Vanguards occupy the front of the marching order. Vanguards open doors and operate crude mechanisms when needed. When not exploring, Vanguards guard allies, focusing attention on unknown areas ahead of the group. Vanguards are responsible for first impressions in encounters and determine initial monster reactions. In combat, Vanguards form the front line and protect allies. When exploring, Rearguards occupy the end of the marching order. Similar to Vanguards, when not exploring, Rearguards defend allies, but focus attention on where the characters have come from rather than ahead. Rearguards also generally will keep watch in contexts where that might be fictionally reasonable, such as when searching a dungeon room or setting up camp. When exploring, Scouts move slightly ahead of their allies. This allows Scouts to report back about danger before it descends on the entire group. Additionally, Scouts may advance beyond signs of obvious allies such as illumination and so move more stealthily if desired. When combat begins, scouts have a chance to hide. Scouts tend to be snipers or skirmishers and so if not hidden stay in the center of the group so as to not expose themselves directly to danger in melee. When exploring, Torchbearers tend to stay toward the center of the group and always keep a light source active when necessary. In combat, they begin with at least one hand occupied by whatever light source they are using. These are probably incomplete specifications and I am sure there are some other common roles that I am neglecting, but hopefully the idea is clear. There is some redundancy between roles and classes. It does not seem like a bad approximation to assume, for example, that one of the fighters would be the one to open a door and one of the thief or rogue-type characters would be scouting, but somehow in practice that does not seem to be enough. I think that having another field on the character sheet that can be interpreted as default job contains different enough information and comes up commonly enough to be worth the little extra space required. This entry was posted in Rules on September 12, 2016 by Necropraxis. I recall someone using these exact terms. Maybe it was you? This seems very familiar. Yeah, I wrote about something similar a while back applying the role concept to marching order. I had forgotten about that. Thanks for the reminder. This extends the same basic idea over different scales of play in a slightly more systematic manner and places the concept of role more in the players’ hands. In the old post, it seems like I intended that the role be more of a per session or per delve determination that the referee would track. I like the idea of party placement and role, but I think there’s such thing as too much gamification. Scout, vanguard, body and rear are great for party placement, and to me tell enough about where PCs are in the event of a trap or suprise. What I mean is that limited classification may be useful, in determing PC unconcious behaviour (rearguard tend to loiter in back looking down the backtrail, etc), and fot determining gamefied/non spaitally represented movement options. However, adding default assumptions about who physically investigates what seems (i.e. the obvious ‘Expert – Arcane” who investigates magical seeming puzzles always) an unecessary level of abstraction unless it’s part of a sort of caller system for a very fractious player group. Oh I definitely agree with that last part. These are not rules intended to fix social problems at the table, just methods to precompile decisions for certain common dispositions and actions. One could easily remove box opening from the domain under consideration if that does not come up regularly in play.